A new special issue of JGR: Oceans and JGR: Atmospheres presents new insights into the dynamics of dense water formation in the western Mediterranean Sea and its biogeochemical consequences. One of the general characteristics of the Mediterranean Sea is low nutrient and mineral levels, a condition known as “oligotrophy,” which affects biological productivity. This is caused partly by the way in which water circulates through the Strait of Gibraltar: there is an eastward flow of nutrient‐poor surface waters in from the Atlantic and a westward flow of nutrient‐richer deep waters out of the Mediterranean. However, there are certain areas of the Mediterranean where particular oceanographic and atmospheric conditions generate intense vertical mixing in the water column. In these areas of “dense water formation,” deep mixing (sometimes reaching the bottom at about 2,500 meters) can occur during the second part of the winter, dependent on previous autumn meteorological and oceanic conditions. They are located in the North of the Mediterranean Sea (Gulf of Lion, Adriatic Sea, Aegean Sea, Levantine basin). Dense water formation is geographically and temporally specific but has significant repercussions on the biogeochemistry of the whole Mediterranean Sea. Although dense water formation is geographically and temporally specific, it has significant repercussions on the biogeochemistry of the whole Mediterranean Sea. This process injects massive amounts of nutrients into the surface layer, triggering large blooms in spring, while also exporting organic matter and oxygen towards the deep layers. Thus they contribute to the ecosystems vitality at all depths, and to the medium- and long-term storage of carbon. The Mediterranean Sea is proving to be particularly sensitive to climate change. The increase in surface layer temperature will affect vertical stratification but this is counterbalanced by evaporation causing increase of salinity. Thus, the Mediterranean could continue to produce dense water but through different mechanisms, and this could dramatically affect water mass characteristics, nutrient budgets and ecosystem functioning. Researchers set out to study physical oceanic and atmospheric processes, and the biogeochemical response of the pelagic ecosystem. To better characterize and understand dense water formation phenomena in the northwestern Mediterranean, the DEep Water formation EXperiment (DEWEX) – part of the MerMeX (Marine Ecosystems Response in the Mediterranean Experiment), MOOSE (Mediterranean Ocean Observing System for the Environment) and HyMeX (Hydrological cycle in the Mediterranean EXperiment) programs – was carried out over a full annual cycle from June 2012 to September 2013. Researchers set out to study physical oceanic and atmospheric processes, and the biogeochemical response of the pelagic ecosystem. All these programs were financed by MISTRALS (Mediterranean Integrated STudies at Regional And Local Scales). The field campaigns focused on the area off the southern coast of France between Corsica and Sardinia to the east, and the Balearic Islands to the west. This area is characterized by strong northerly and northwesterly winds during autumn and winter. These winds drive intense air-sea exchanges, which are the origin of deep convection episodes. In spring, these processes trigger an intense bloom of the Mediterranean Sea. During summer, the water column is strongly stratified, limiting nutrient inputs, and leading to strong oligotrophic conditions. The reconstruction of these seasonal cycles for the oceanic, atmospheric, and biogeochemical components constituted an undeniable observational challenge and pushed for a completely new approach in observing strategy. For this reason, the DEWEX experiment was conceptually designed to complement ‘classic’ ship-based and airborne samplings with a large variety of autonomous platforms (gliders, profiling floats, mooring lines, balloons), as well as satellite remote sensing (altimetry, sea surface temperature, and ocean color). 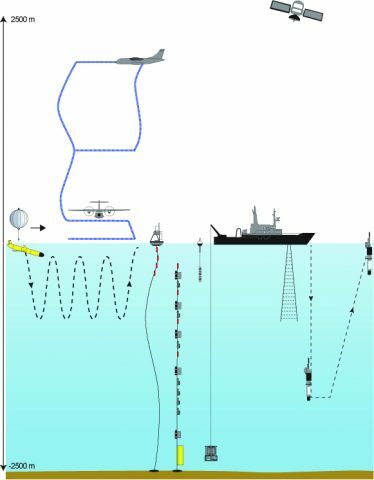 The autonomous platforms gathered in situ data during the intervals between the cruises, providing an accurate description of the physical-biogeochemical evolution for the whole 2012–2013 year. These efforts provided a unique and comprehensive data set to validate and improve physical / biogeochemical coupled models. The studies also revealed important dynamic processes at small scales. Overall, the research has provided a new understanding of the quantitative and qualitative dimensions of dense water formation. 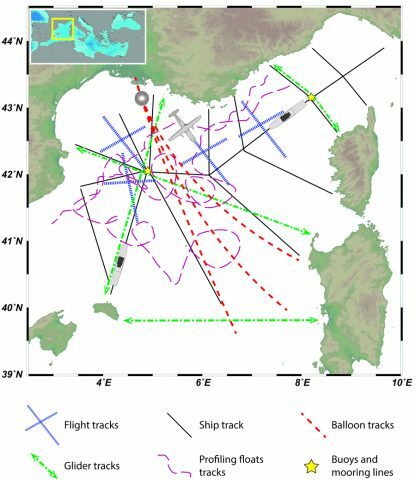 A joint special issue of JGR: Oceans and JGR: Atmospheres presents the major results of this work combining observation and modeling at multiple spatial and temporal scales. Some of the research focused on how the dynamics of the atmosphere and the ocean affect dense water formation. By characterizing the multidimensional complexity of the associated energy and mass fluxes, in particular latent heat air-sea exchanges under strong wind conditions and lateral dispersion of ventilated deep waters, it is now clear that most of the operational numerical weather forecast models using a one-dimensional description of the vertical exchanges must be improved to properly represent such a phenomenon. Other work compared in situ data to satellite and model measurements and showed, for example, that the reconstructed time series of surface chlorophyll a retrieved from in situ observations was similar to those obtained from satellite observations. In combining all chlorophyll a data from the available proﬁles, it was then possible to describe its vertical distribution throughout the annual cycle in different bioregions. Yet other studies investigated the interannual variability of dense water formation using the 2012–2013 observations as a benchmark. Measurements revealed that bottom-reaching convection and the production of new dense water are characterized by a rise in temperature, salinity and density, and occurred every winter between 2009 and 2013, making this a particularly long period of intense air-sea interactions compared to what has been observed since the late 1980s. A further research component was the biogeochemical effect—and ventilation, in particular—of dense water formations, including studies of small scale phenomena linking the bottom (about 2,500 meters depth) nepheloid layers and resuspended particles to the surface layers. There were also studies of annual primary production in areas of so-called ‘deep convection’, ‘moderate convection,’ and relatively ‘shallow mixed layers’. The emerging general pattern of these latter studies is that the size of the zone impacted by convections strongly influences the intensity of the resulting spring bloom, whereas the depth reached by the convections plays a key role in the bloom diversity, in influencing the elemental stoichiometry of the upwelled waters. There are many fascinating results presented in this special issue on the interplay between the atmosphere and ocean, and the impact of ocean circulation and mixing on biogeochemistry. There are many fascinating results presented in this special issue on the interplay between the atmosphere and ocean, and the impact of ocean circulation and mixing on biogeochemistry. The field observations also serve as an invaluable reference data set for improving models of surface fluxes, convective processes, dense water formation rates, and physical-biogeochemical coupling processes. We hope that readers will enjoy the results presented here and use them to further improve our knowledge of ocean circulation, biogeochemistry, and biology in a much broader context. Citation: Conan, P., P. Testor, C. Estournel, F. D'Ortenzio, and X. Durrieu de Madron (2018), Observing winter mixing and spring bloom in the Mediterranean, Eos, 99, https://doi.org/10.1029/2018EO105887. Published on 09 October 2018.